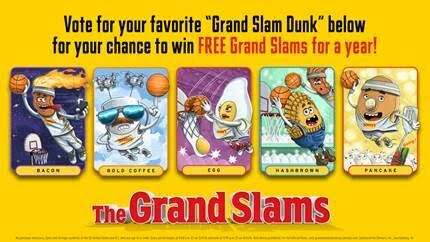 On Thursday, March 31, the breakfast stars of Denny’s slam dunk web series, The Grand Slams, will be live at the College Slam Dunk Championship on ESPN at 9 p.m. The crowd can get in on the diner action and make some noise from the sidelines with free Denny’s thundersticks, as well as build their trading card collection with one-of-a-kind cards for each of The Grand Slam characters given out during the game. Watching from home? Don’t worry – Bacon, Egg, Sausage and Pancake are coming straight to your living room! A teaser of the newest episode from The Grand Slams will air during the College Slam Dunk Championship, and you won’t want to miss this episode! After watching, fans can vote online via TheGrandSlams.com for their favorite Denny’s Dunk by The Grand Slams cast and simply leave a comment for a chance to win free Grand Slam®s for a year – talk about a slam dunk deal!